4mm (approx). Lobster Lock. 18" long (approx). 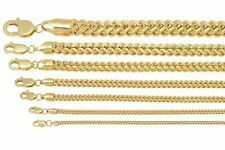 1.5mm Franco Link Chain Necklace Lobster Clasp Real Solid 10K Yellow Gold 20-30"
This lovely franco chain necklace is styled in 10K yellow gold. A gift any person is sure to love. Material: 10k Yellow Gold. REAL 10K STAMPED GOLD | 16" 18" 20" 22" 24" 26" 28" 30"
10K Yellow Gold 2.5mm Foxtail Box Wheat Franco Pendant Necklace Chain 16"- 30"
10K Yellow Gold 4.5mm Foxtail Box Wheat Franco Pendant Necklace Chain 18"- 30"
This shiny, vintage Franco link chain necklace is absolutely beautiful. This piece was made in the United States, in the old traditional way, of jewelry making, out of 10kt yellow gold. This piece is very flexible, sturdy and strong, it will last for many years to come. 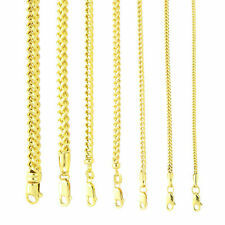 Item: Solid 10K Yellow Gold Franco Link Chain. 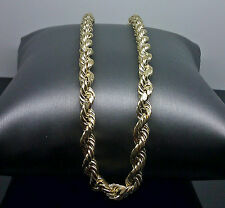 This chain is made of 10K yellow gold. Material: 10K Yellow Gold. Weight: 6.5 grams. Size: 24" long, 2.4mm wide. Style: Diamond Cut Franco Chain Necklace. Material: 10k Yellow Gold Hollow. I can assure you the quality of this necklace. 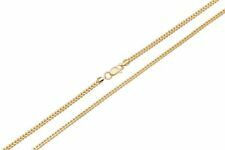 Authentic 10K Hollow Yellow Gold Franco Necklace Chain 1.5-6mm/16-40"
This is sizable. However, we have a length in various sizes. Width Of Charm 2mm (approx). Weigh t Of Chain 6.5 grams (approx.). Our Diamonds Are 100% Natural And Are NEVER Treated Or CLARITY Enhanced.. This chain is all the way real 10 k gold. It is not plated, bonded or overlaid. The difference between the solid and hollow is only in the weight. Solid tends to be heavier than the hollow and that is the reason it feels light. Weight : 6 grams. Length : 28". 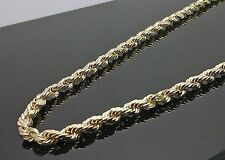 Mens Ladies Real 10K Yellow Gold Italian Franco Link Chain Necklace 1.5MM 22-30"
Franco Link Chain Necklace. Beautiful 10K Karat Yellow Gold Designer. Gold Color : Yellow Gold. 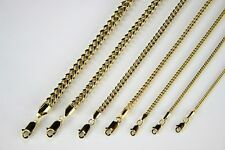 Chain Thickness : 2.5mm x 2.5mm. Total Weight : 5.9 Grams. This item is presented to you by H&R Jewelry & Loan Co.
10K Yellow Gold Hollow 4mm Franco Chain Necklace 22" 24" 26" 28" 30" 32"
10K Yellow Gold 2.5mm Square Wheat Box Franco Chain Necklace Lobster Clasp 20"
The chain fastens with a 10K Yellow Gold Lobster Clasp that is very strong and easy to use. Franco Chains are especially known for their classic style, shine, and strength. This chain isNOT PLATED, NOT FILLED. Lobster Lock/ Box Lock. 18- 19 grams. Men Ladies 10k Real Yellow Gold Pop Corn Snake Franco Chain Necklace 3mm 24"-28"
10K Yellow Gold Miami Cuban Chain 28" Long, 5mm. Miami Cuban Chain. 10 KT Gold. 10K Yellow Gold 3mm Franco Square Box Franco Chain Necklace Lobster Clasp 20"
10K Yellow Gold 2mm Wheat Box Franco Pendant Necklace Chain w/ Lobster Clasp 28"
10K Yellow Gold 2mm Wheat Box Franco Pendant Necklace Chain w/ Lobster Clasp 22"
10K Yellow Gold Womens 2mm Square Box Franco Wheat Pendant Necklace Chain 16"
10K Yellow Gold 3mm Franco Square Box Franco Chain Necklace Lobster Clasp 24"
10K Yellow Gold Womens 1.5mm Foxtail Wheat Box Franco Pendant Necklace Chain 24"
10K Yellow Gold 2.5mm Square Wheat Box Franco Chain Necklace Lobster Clasp 28"
10K Yellow Gold 2.5mm Square Wheat Box Franco Chain Necklace Lobster Clasp 26"